Saheb Singh Sultan is an elaborate recreation of a British Raj era railway station. 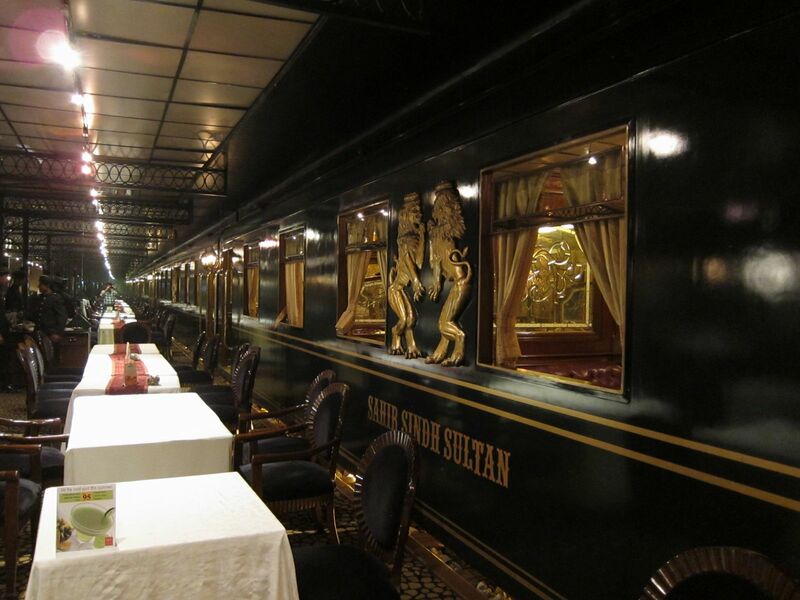 Tables are set out on the railway platform and within the recreated Pullman-style carriage with its gleaming woodwork and furnishings from another time. 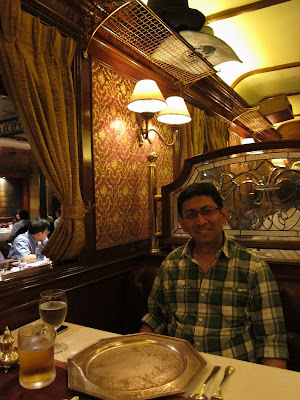 Waiters move around busily, dressed as porters and ticket-checkers; occasional announcements and the sound of steam engines from hidden speaker systems completes the effect quite nicely. We were initially offered a table on the ‘railway platform’ but on our request they gave us a seat inside the Pullman carriage. I laughed out loud when I perused the menu. There was a dish called Laupathgamini Bhatti Ka Tikka! Only the most fluent Hindi speaker will know Laupathgamini means railway train (literally means that which travels on iron rails). Then there was a Bogga Sahib ka Chicken Kabab dedicated to a wealthy Englishman who lived in Calcutta. And so it went! We decided to settle for the grandiose Janab Todarmal’s Chicken and Canning Street Ke Chowrahey Wali Tikki. 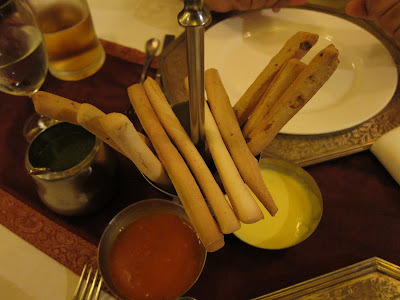 As we waited for our food, the waiter put some breadsticks and dips in front of us. Todarmal was an Indian warrior who went on to become Finance Minister in Mughal emperor Akbar’s cabinet. The kabab named for him turned out to be a tongue tingling preparation of chicken drumsticks stuffed with dry fruit and minced chicken. 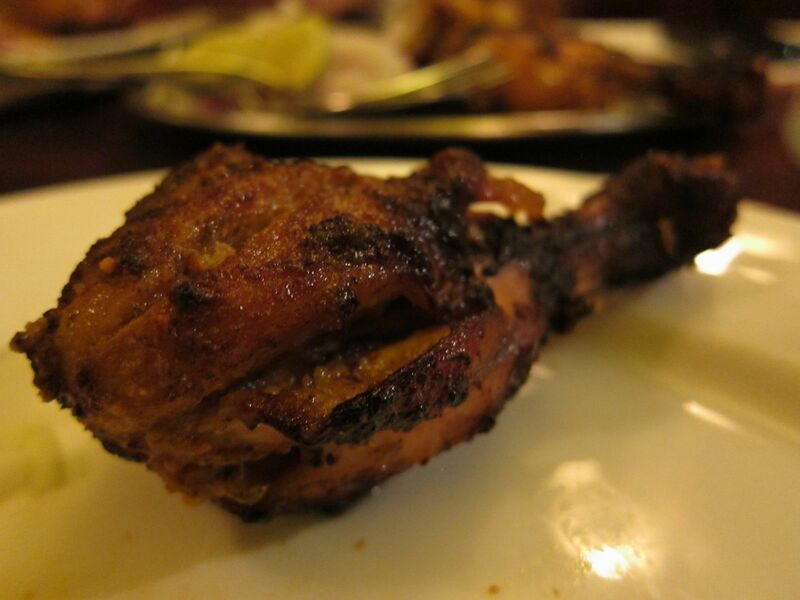 The drumsticks had been marinated in yellow chili and cooked in a charcoal tandoor. 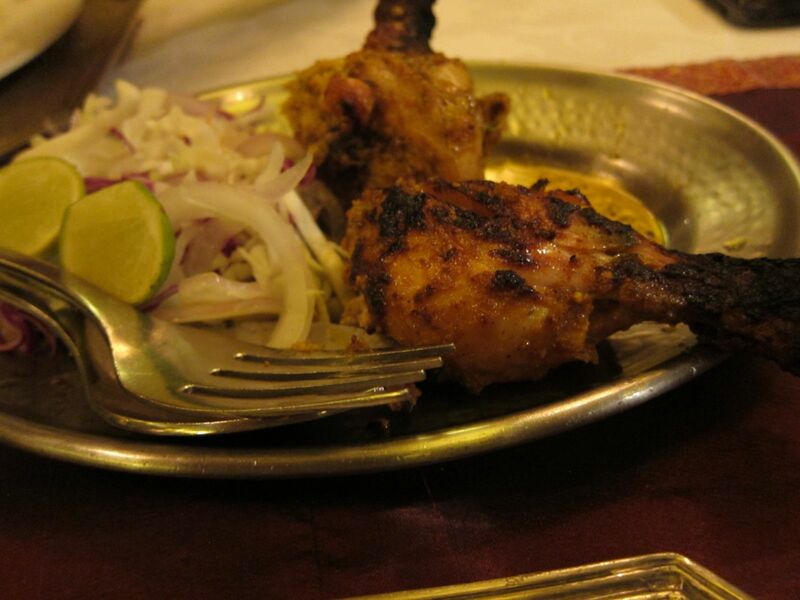 The kabab was very good, the chicken juicy and succulent while the stuffings provided an exciting mix of tastes and textures on the palate. 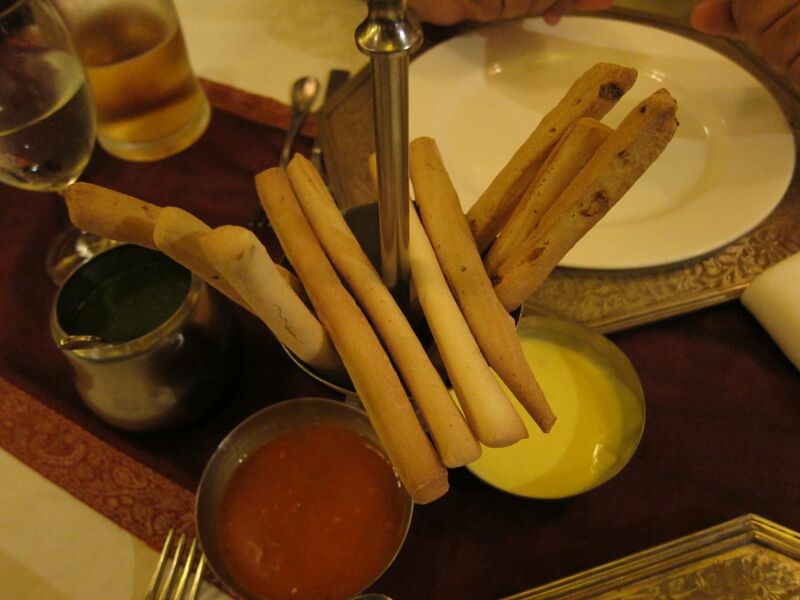 The Canning Street Tikkis is named after a street in Calcutta, the city from which the British ruled India for much of the initial years of the Raj. 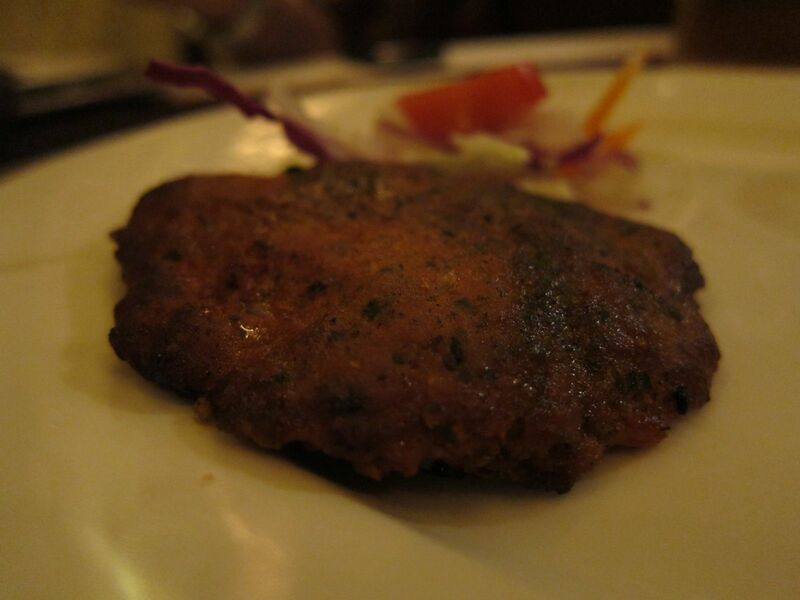 The dish bearing its name was made of roughly pounded lamb blended with hot spices with a hint of fennel that had been formed into patties and fried to perfection. Again a dish that I found very interesting on the palate. 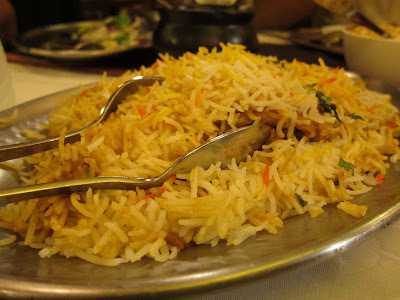 We had ordered some Gosht Biryani that was pretty good too. The fragrant rice with succulent chunks of lamb made for a satisfying dinner. Finally, we ended with the Tilli Wali Kulfi, Indian home-made ice-cream-on-a-stick. 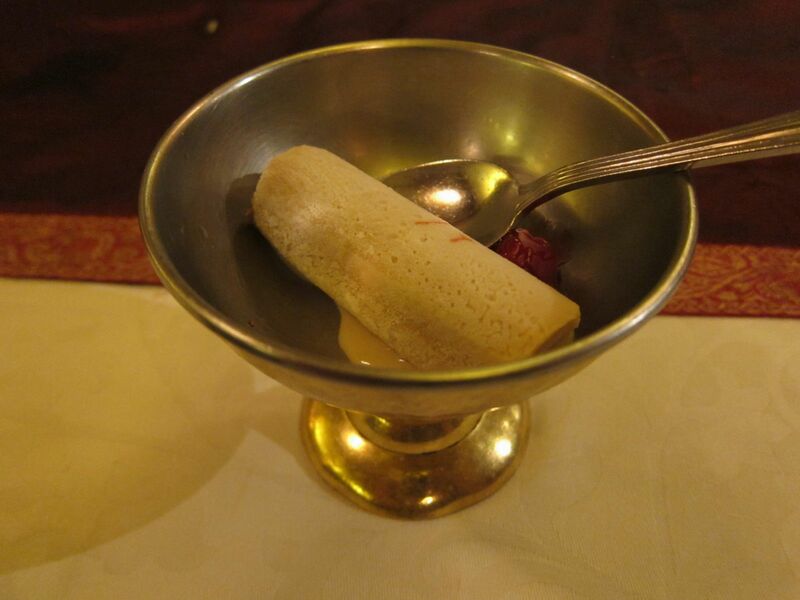 We shared a single portion and the waiters were nice enough to take the kulfi off the stick and serve us half portions in silver bowls. Overall this was a fun experience and the food pretty good too! I only wish the waitstaff showed a little more enthusiasm. 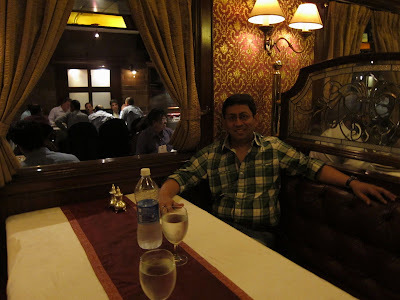 It was IPL season and I was at the ITC Gardenia and it turned out to be where the Mumbai and Chennai teams were lodged for their crucial match the next day. It was good to see several star cricketers up close and personal. But with all that food inside me, I wasn’t in the mood to hang around and get some pictures. So off I went to my room, lay back and turned on the TV for the first qualifier between Delhi Daredevils and Kolkata Knight Riders. What a match that turned out to be!